Today at Drink Portland, I’ve posted a guide to the city’s few remaining cigar bars. There are only eight of them, so click through if you’re looking for a place to escape the rain with a cigar and a drink. Since Oregon’s smoking ban only exempts bars that can demonstrate cigar sales from 2006, it’s essentially illegal to open a new cigar bar. These eight are all we have and all there will be. An update to the law a couple years later also capped the number of tobacco shops that can allow smoking. Ban advocates predicted that Oregon’s law would drastically reduce the rate of heart attacks in the state. As I noted in the Oregonian, that never came to pass. 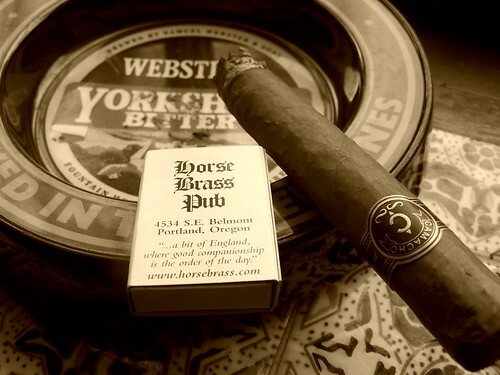 Pre-ban, my favorite place to have a cigar in Oregon was the Horse Brass Pub. My ode the Horse Brass is here. It’s still a great bar, but you can’t light up there anymore. Eater Portland catches up with me and several other bartenders around town about our favorite places to nurse a hangover — as if I would have experience in that sort of thing. Click through to find out where Adam Robinson, Doug Derrick, Mary Bartlett, me, and a few others like to go. It’s Cocktail Week across the Eater blog network, and as part of that series they’ve published recommendations of the most “essential” cocktail bars in the US. It’s a pretty solid list. I’ve made it to 19 of the 38, a number held down mostly by the fact that I haven’t visited New York since moving from the East Coast in 2008. Last night Portland lost one of its legendary figures, Don Younger, owner of the Horse Brass Pub. If you enjoy Oregon beer, you should raise a pint to him tonight. As a relative newcomer here the story’s not mine to tell, but suffice to say that he and his bar did a great deal to nurture the brewing community that’s made Portland justifiably famous for beer. Imbibe wrote about that history in one of their first issues. John Foyston has more in the Oregonian, and Ezra is collecting memories of Don at the New School. Many more tributes will be rolling in. I’d read about Don and the Horse Brass before I’d moved to Portland and made a point to visit the bar on my first trip out here several years ago. When I finally did move here the Horse Brass became one of the first local bars where I felt at home. I loved beer, but it was also one of the best places to enjoy a cigar. Knowing few people in the city, it was a place I could visit anytime and strike up a conversation with whomever else was there at the end of the bar where the cigar smokers gathered. On one of these early visits Don was holding court at his usual spot, and though I didn’t meet him then I still remember the night. There was a young guy a few spots down from me nursing a beer and reading a book alone. Don called him over: “What are you doing, you don’t come to a bar to read a book!” Just like that the guy was introduced to the group and welcomed into the pub community. A few weeks later I tried to meet Don myself. The statewide smoking ban was about to go into effect and I wanted to talk to Don for some articles I was working on. Many bar owners privately opposed the ban, but he was one of the few who actively fought against it. I had no luck getting an interview though: The bartenders informed me that Don was sick of talking to people about it. I ended up writing about the ban in the Oregonian anyway, not expecting to hear from Don. Then I saw him at the Horse Brass a few days later and introduced myself. Amazingly, he knew exactly who I was, said he loved my article, and that if he’d known who was asking for him he would have gladly talked to me. I’ve never been more flattered to find out that someone had read something I wrote. As intimidating as he was by reputation, in person he was as friendly as could be, the perfect publican. A few months later I noticed something that cracked me up: He’d posted a clipping of the article in the hallway of the Horse Brass, right by the bathrooms, with some patron adding a graffitied mustache to my headshot. It stayed there for about a year. I may never win a Pulitzer, but how many Pulitzer winners can say they’ve had their writing displayed outside the men’s room of the Horse Brass? I’ll take it. Unfortunately I didn’t get to know Don well after that. I spent less time at the Horse Brass after the ban, and reportedly so did he. But I do have one more story. The final night of smoking at the Horse Brass was not, in fact, the last night one could do it legally. A few days after the ban took effect Don allowed his regulars one more chance to light up in defiance of the law. Though I hadn’t arrived for this part, I’m told by others that Don called for patrons’ attention a half hour before we lit up to let everyone know what was going on. He said he knew that smoking is illegal now, but that he’d promised his friends they’d have one last session together. Anyone could leave if they wanted to, and he gave them the phone number they could call to report him, but this was going to happen. The bar burst into applause. And, of course, nobody called the number. What a man. What a bar. Long live the Horse Brass. My friend Brandon Wise at Irving Street Kitchen is hosting a series of hands-on booze and brunch events in collaboration with local bartenders. On January 8 Dave Shenaut comes in for some hangover-curing cocktails, on January 22 Neil Kopplin whips up drinks with local ingredients, and to kick things off this Saturday I’m joining Brandon to talk holiday classics. We’re featuring Bols Genever, Damrak Gin, and Galliano in a welcoming wassail, a New Orleans Fizz, and a rich hot cocoa. $40 covers all the drinks and brunch from chef Sarah Schafer. Details for making reservations are in the press release. I have an article in the Oregonian today and amazingly it’s not about smoking bans. 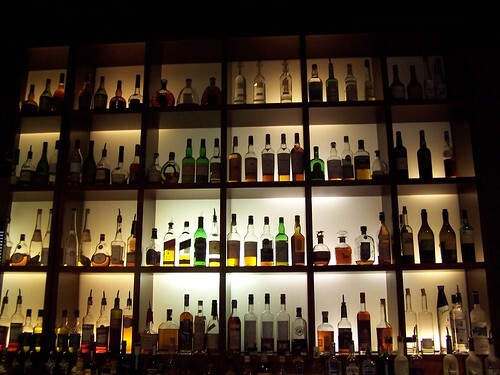 It’s about how to entertain guests at home without spending the entire night behind the bar. Of the three drinks included, only one is a individually mixed cocktail. The other two are a liqueur-spiked hot chocolate and a punch excerpted from David Wondrich’s forthcoming book, Punch: The Delights (and Dangers) of the Flowing Bowl. I can’t recommend Wondrich’s book highly enough. He’s done a tremendous amount of work tracking down punch recipes, obtaining obscure ingredients, and translating incomplete instructions into methods readers can reproduce at home. This is a fascinating part of drinking history that’s been largely forgotten, and Wondrich’s research into the culture surrounding punch is of even greater interest than the drinks themselves. The book is a game changer. If you want to serve punches at home, be sure to pick it up a copy. It comes out November 2. I should also mention that I’m joining the amazing staff at Metrovino. This is one of my favorite restaurants in Portland, with fantastic food and an amazing wine list. Their cocktails and spirit selection have also been very good, but up until now they haven’t had a full-time bar manager. I’m happy to say that my friend Kyle Webster, formerly of Noble Rot, has come on board to take over that role and put even more focus on spirits and cocktails. I’m coming in to join him once or week or so. Kyle’s first menu is already live, so stop in soon to check it out. One of my favorite new bars in Portland, Spints Alehouse, has a couple fun events coming up. First is the St. Patrick’s Day celebration, during which chef Alyssa Gregg is offering a different sausage pairing for every beer on tap. That’s 13 sausages, people! There’s no prize for getting through all the pairings but it will be fun to try. After that, I’m getting back behind the stick for a week-long run as guest bartender. In addition to Spints’ own craft cocktail menu I’ll be serving up a few drinks of my own. The plan as of now is for me to be there Friday-Sunday this week and Thursday-Saturday next week, working 4-9ish each day. I’d love to see some familiar faces there and if you haven’t been to Spints yet I highly recommend it: Great German-inspired food, a really good beer list, and a very cool atmosphere. For more information on the beer and photos of the winter dishes, check PDXplate. Next month is Carlyle’s seventh anniversary. February also marks the end of our current lease. Both milestones are significant in that they factor into my decision to announce that Carlyle will serve it’s last meal on Sunday, February 14th. I would like to express my sincere gratitude to the many loyal customers, employees, and friends who have made Carlyle special. Though saddened by the closing, I ’m comforted by wonderful memories, ,and the opportunity to have worked with some very talented people. I hope that over the next two weeks you’ll make a point of joining us for dinner or a drink. In addition to some recent menu changes, Chef Martin will be presenting a special prix fixe dinner, offered on both February 13th and 14th, to celebrate Valentine’s Day, and to serve as our farewell. I’m eternally grateful to Bruce and to Neil, who first hired me there, for trusting me with their bar program. It’s been a fun ride and great platform for me as a mixologist. I think we succeeded in turning Carlyle into one of the best places in Portland to have a cocktail. Unfortunately we’ve faced an uphill battle running a destination restaurant in a tough location and a down economy, so this closing is understandable. 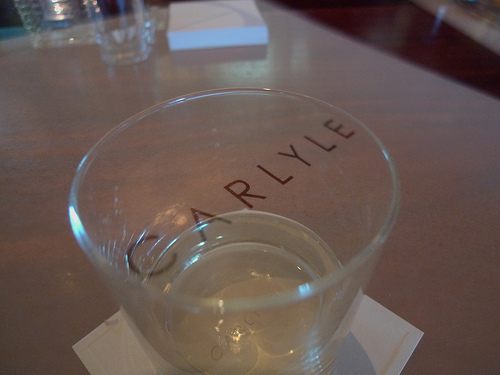 If you haven’t been into Carlyle yet, do stop in soon. And if you’re among the many friends I’ve made while working there I hope I’ll see you at least one more time before we close. Last call is Sunday night, February 14. Fernet is on the rail. Where to eat/drink in Houston? I’ll be back in my hometown December 25-29. Obviously I want to stop in at Anvil, where bartender Bobby Heugel is serving up creative cocktails. And word is David Buehrer has finally brought great coffee to Houston with his Tuscany Coffee. Good Tex-Mex is a must and easy to find. I’d usually consider barbecue essential, but Podnah’s Pit in Portland is such a good fix that I might do without. Where else should I visit? Author Jacob GrierPosted on December 24, 2009 Categories Alcoholic Beverages, Coffee, Food and Drink, Personal, Restaurants, TravelTags Houston, Texas7 Comments on Where to eat/drink in Houston? Purists will be glad to know the OPVD didn’t make the cut on our new, trimmer cocktail menu. We’re super serious now. Restaurant of the Year went to Beaker and Flask. It’s a totally deserved honor and it couldn’t have gone to a nicer bunch of people. Congrats, guys! El Inka — Of all the food I miss from Arlington, there’s nothing I crave more than Peruvian-style rotisserie chicken. Restaurants serving pollo a la brasa abounded in my old neighborhood. The first place I’ve found it around Portland is way out in Gresham. Yet when the craving strikes the drive is worth it. El Inka isn’t quite comparable to the best in Virginia, but the crisp, flavorful skin is right on. The fried yuca, plantains, and grilled beef heart are also good. The fried hot dogs are less interesting than they sound. Why isn’t there a place like this closer in? I think it would do well. Beaker and Flask — Kevin Ludwig’s long-awaited bar is finally open, significantly upping the east side’s cocktail cred. The cocktails are as excellent as expected. More importantly, beer isn’t just an afterthought here and the kitchen puts out some tasty fare. Good cocktails are easy to find in Portland, but places that are strong on mixed drinks, beer, and food are rare. Beaker pulls it off to become my new favorite after work spot. Koi Fusion PDX — Actually a cart not a restaurant, but my search for cheap, delicious post-shift meals is a lot easier thanks to these guys. Think bulgogi, short ribs, or spicy pork served in a taco with cabbage, bean sprouts, daikon, and other veggies. Follow them on Twitter to find out where and when they’re serving. I’ve been waiting until things are official to post the good news, but I’m happy to report that my job search here in Portland is finally at an end. 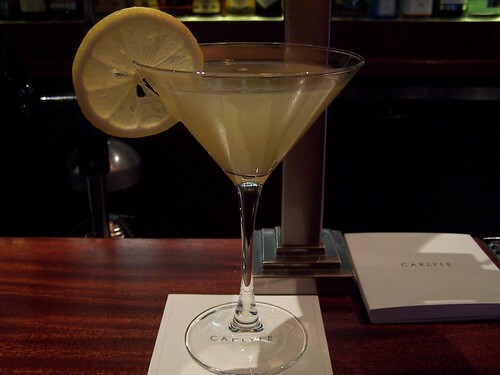 I’ve been lucky so far to pick up a couple shifts a week behind the nicely stocked bar at the Carlyle. I got even luckier last week when Neil Kopplin, our talented bar manager, decided to move on to a new job. I’ll be stepping into his shoes starting tomorrow. To go from underemployed cocktail blogger to lead bartender at a place like Carlyle is a fantastic opportunity and I’m excited to start leaving my mark on the place. Neil’s new home is behind the bar at Clyde Common with Jeffrey Morgenthaler. Clyde’s already one of my favorite spots in town and I look forward to seeing my two friends there. They’re open later than Carlyle, so I’ll be a frequent visitor for those oh so necessary post-shift drinks. We’re celebrating Neil’s last shift with House Spirits’ Recession Proof Mixology event. Stop in today from 4-7 for a menu of $5 Aviation gin cocktails and stay even later for what’s sure to be a memorable night.